Dense, rich, and luxurious are a few terms that come to mind when describing this chocolate fondant cake recipe, which unbelievably is also a flourless chocolate cake. The cake is made with bittersweet chocolate and a touch of vanilla, plus the beauty of this recipe is it also makes a silky loaf cake, or gateau, that melts in your mouth. A cake perfect for anyone with a restricted diet of no gluten or wheat free. The cake can be made in a loaf shape and cut into thick fingers or as a classic round and cut into wedges. Both are equally as good. 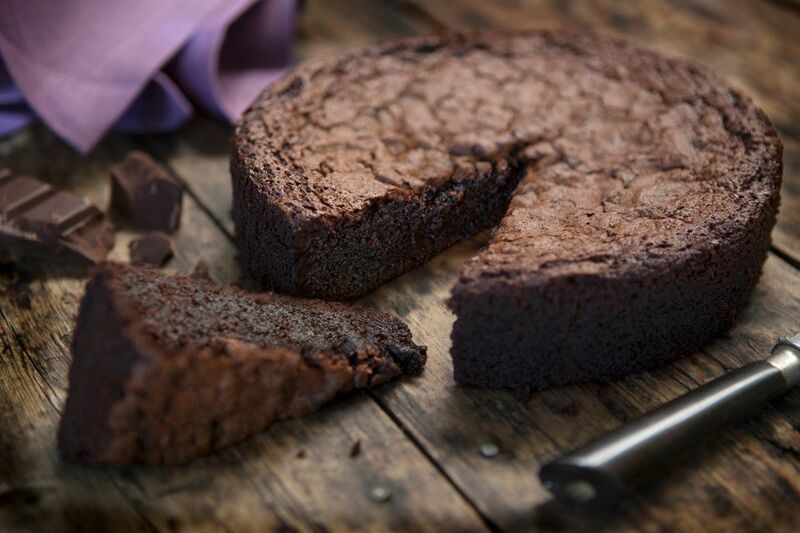 Cook's note: This flourless chocolate cake recipe is very similar to a chocolate truffle in both flavor and texture; always use a premium chocolate with a good cocoa content of at least +50% for the best results. In a large saucepan, stir together the egg yolk and the granulated sugar until it turns light yellow and slightly foamy. In a separate small saucepan over low heat, bring the milk to a simmer. Once the milk is just beginning to bubble (be careful not to let the milk boil or the milk may curdle), add half of the milk, whisking constantly, to the egg-sugar mixture. Add the remainder of the hot milk to the tempered eggs, continue stirring, and cook over low-medium heat for 1-2 minutes, until the mixture thickens and coats a spoon. Place the chopped chocolate into a double boiler set over 2 inches of simmering water. Pour the milk-egg mixture over the chocolate, stirring constantly, until it is melted and the mixture is completely smooth. Chocolate can b e melted in the microwave but this must be approached with caution as the chocolate can easily burn. To unmold the cake, place the bottom of the pan into a large pan of hot water for 30 seconds. Loosen the edges of the cake with a butter knife or an offset spatula, and invert it onto a chilled serving platter. Cut the cake into crosswise slices and serve it cold. For a really grown up treat (this is not suitable for the children) add a few drops of your favorite liqueur to the chocolate mixture and stir in. .